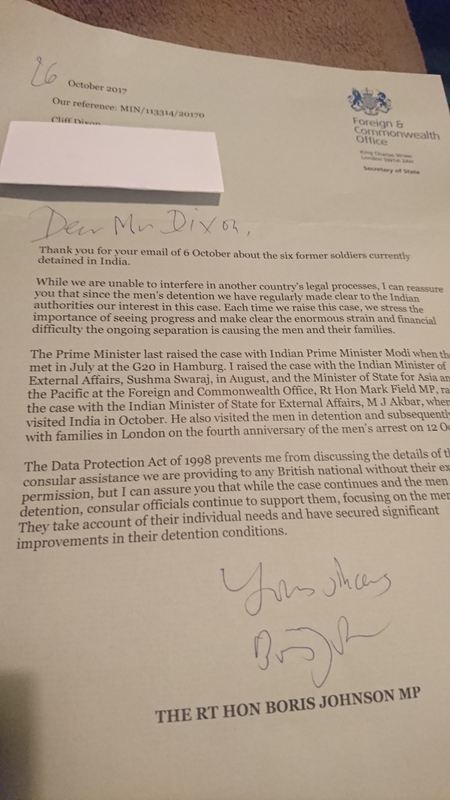 I recently wrote on this blog about the British ex-servicemen currently held on trumped up charges in an Indian gaol. Thanks you for your email of 6 October about the six former soldiers currently detained in India. While we are unable to interfere in another country’s legal processes, I can reassure you that since the men’s detention we have regularly made clear to the Indian authorities our interest in this case. Each time we raise this case, we stress the importance of seeing progress and make clear the enormous strain and financial difficulty the ongoing separation is causing the men and their families. The Prime Minister last raised the case with Indian Prime Minister Modi when they met in July at the G20 in Hamburg. I raised the case with the Indian Minister of External Affairs, Sushma Swaraj, in August and the the Minister of State for Asia and the Pacific at the Foreign and Commonwealth Office, Rt Hon Mark Field MP, raised the case with the Indian Minister of State for External Affairs, Mr J Akbar, when he visited India in October. He also visited the men in detention and subsequently met with families in London on the fourth anniversary of the men’s arrest on 12 October. The Data Protection Act of 1998 prevents me from discussing the details of the consular assistance we are providing to any British national without their express permission, but I can assure you that while the case continues and the men remain in detention, consular officials continue to support them, focusing on the men’s welfare. They take account of their individual needs and have secured significant improvements in their detention conditions. 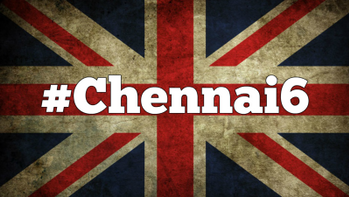 This entry was posted in Armed Forces and Military Covenant, National Events and tagged #Chennai 6, Boris Johnson.